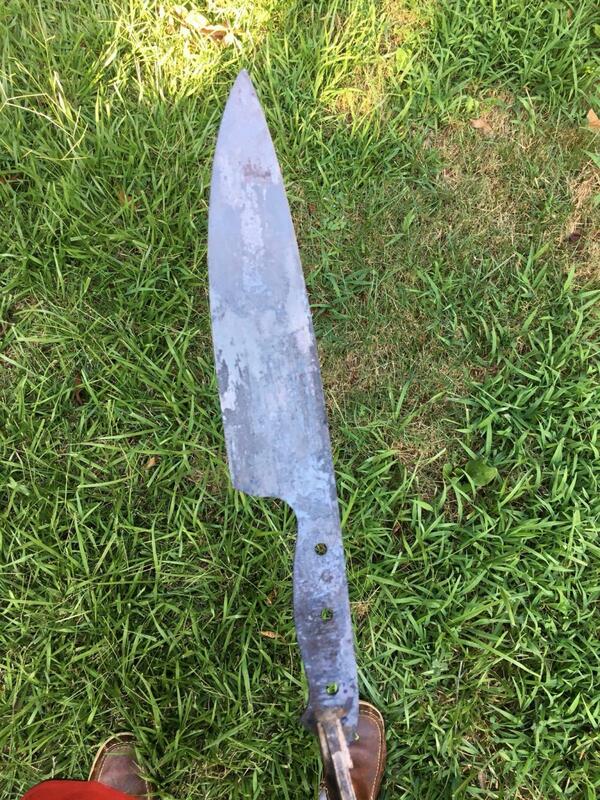 So, I have a large Chef knife forged ready to rough grind and have a potential customer lined up for this bad boy. Ive read some extensive heat treating data by Ed fowler in this steel and was wondering if anyone has a stream lined proven HT regimen for this? I now will be HTing in my new gasser where i have a bit more control. But still not as much as i like. Normalize extremely well, i read several accounts of people normalizing and quenching even....? not sure. Stick it in the freezer? Quenching in canola is fine. Grain refinement is good; keep an eye on the decallesance. At least you will only need short soaks here so that's a plus. Not sure what you are meaning by "Normalize extremely well, I read several accounts of people normalizing and quenching even...? not sure." Where are we going with this statement? Austenizing is going to be tricky. Trying to hold any steel at a 50° range for 10-15 minutes is going to be tricky at best and could quickly undo your grain refinement. It's not totally impossible to heat treat by eye with a long soak but very difficult and even more difficult to tell what the results of your efforts are. Sticking it in the freezer is only going to make the blade cold. Liquid nitrogen would be much better though you might be able to use something like a dry ice/acetone bath to get the retain austenite to convert to martensite. I have only made two test knives out of 52100 and they seemed to do well with a 400° temper. I did two two hour cycles. I do two hour cycles pretty much to make sure the blades are well tempered. It won't hurt anything even if it's longer than needed. Probably the best source of info on treating 52100 is Kevin Cashen. You should be able to make contact with him through Hypefree Blades. Kevin has to tools to do real testing on the steels that he uses like metallurgical microscopes and a scanning electron microscope. There's a lot of misinformation out there on heat treating in general and heat treating 52100 in particular. Good luck. Hope it goes well for you, Gabriel. Let us know. "Normalize as many times as your patience allows." We've go two problems here. The first is that they are not really talking about normalization; they are talking about thermal cycling. This is a common bit of confusion. I think that you should be fine trying it by taking the steel to a bit above decallesance, then right after the decallesance passes, finally just before you get decallesance. I think that you can see how this whole process is improved by having a regulated high temperature oven available. The other problem is I'm not sure that they know what they're talking about. The best that I can figure is that they are trying for some super fine grain refinement. Now with 52100 you're not going to run into a problem where you get the grain so fine that the steel won't harden as it theoretically might with some shallow hardening steels, you're just spinning your wheels. The guys down here who play with 52100 (Len Landrum, Bill Wiggins, James Gibson) do not have any problems with reduced hardenability after thermal cycling ten or fifteen times. There's just too much chrome in it to keep it from being deep-hardening. Len is the one who got a grain size of 13 with it, and industy only measures down to 10. He was told that was not possible. During a cutting competition I watched Bill Wiggins mis-swing at a can and take an infh-long slice off the corner of a mild steel tabletop. The hyper-cycled 52100 was not even scratched. It's tough steel if treated properly. That's priceless! I never said it was easy to deal with (I don't use it myself), I just said it can make a heck of a knife. And use three times the belts a plain carbon steel does. I think that you may need to look into some carbide bits. These were carbide bits believe it or not lol... anyway I attempted to thermocycle this blade.... i lost count.. Somewhere around 5 i developed a saggy warp and had to fix it and went back for several more. As soon as the color went to black i quenched in water to ensure the pearlite transformation (did i regurgitate that correctly?) anyway... Heat treated it and she's in the oven. ZERO doubts that it hardened fully..
im excited to get it out and sharpened to do some tests. Interests:My family, bladesmithy, blacksmithy, smelting, chemistry, metallurgy, and of course counter-strike for the past 11 years. Hardening fully isn't difficult. Most steels can fully harden in a wide range of temperatures. The key point that was presented was heat control. You are playing in a really small window with a long soak to achieve the most that you can get out of the steel. When I say most, that means peak hardness, taking advantage of carbide distribution, quality and size of grain, etc... And that's assuming your eye knows the difference between 1450 and 1500. Or 1450 and 1600. Even seasoned smiths have difficulty discerning a difference of 100 degrees. I would not dip the blade in water to cool it off as soon as it went to a black heat. I would wait until it attracted a magnet again to make sure that it had undergone complete phase change and all the austenite had converted to pearlite. I'm trying to get my head around a TTT diagram on this but I think that you might get some martensite to form if you do it too soon. Black heat is quite a bit below non-magnetic. Also, if it is that cool you would be incredibly hard pressed to get a measurable amount of martensite. I would also like to point out that while really precise digital controls can help to achieve optimal results, going by eye and getting slightly less than optimal can still result in a knife that is far superior to a standard commercial blade. For the average American (as far as my experiences go with people I know), really high quality knives just aren't that common. 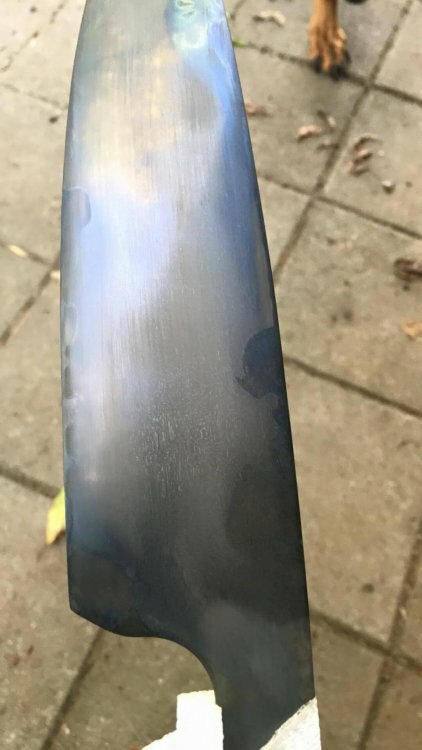 If someone gets their hands on a custom made knife that was "eyeballed during heat treat" it is still fairly likely it will be the highest quality blade they have ever held. Now, this isn't true for professional chefs or collectors. Just your average person. And your average person has never been to a knife show, thinks Buck knives are nice but expensive, and doesn't know any bladesmiths. Right. $100 knives for the average person. But when you want to slap on a price tag of $250+, then you better have the best heat treatment possible. I don't think in that price range that it should be acceptable in kitchen cutlery. The aim is to sell to chefs, or people who want to spend a lot of cash on a knife. We are also talking about soaking steels, and it is really easy in the 10 minutes or more of soaking to heat past the curve in a normal forge. Eyeballing simple carbon steels is probably acceptable, but if someone told me they eyeballed for 10 minutes and have optimal metallurgy, I'm going to laugh. Not intentionally trying to be rude, but I try to hold as high of a standard as possible. Not a fan of the "it's good enough" mentality. If you are going to use 52100, yet it performs no better than 1084, then what is the point? If you are not taking advantage of the properties of the steel, then why not use a simple steel to begin with? Also for home cooks, the same can be said if you sold them a knife out of an inferior steel like 1084. A 1084 kitchen knife is going to be miles beyond what most home cooks have ever dreamed of using. With kitchen knives, and especially of the Japanese variety, you are playing with super thin edges. SUPER thin. This sort of geometry should be the ultimate test of metallurgy in a blade. It's easy to get a blade screaming hard by the least possible means, but to exploit all of what the steel has to offer requires a bit more control. It all boils down to how close you can/want to get to optimal. And "optimal" is a very subjective term too. Everything needs balance. As long as Gabriel is happy with his results, then that is what matters. Nobody will ever have perfection. Therefore everybody has to settle for good enough. Where anyone's individual bar is for what is good enough will be different for different people. It is just good to have that perspective. Also, if you soak just constantly cycling through re/decalescence you will be able to visually hold a tight temperature range and still dissolve all the carbide necessary. So no, more control than visual is not really required. I'm sure he is happy with it, and in the end that is truly what matters. I don't argue that a bit. This boils down to ability and practicality. For the most part you don't see seasoned smiths HTing 52100 outside of a kiln. Their ability may be there to handle it, but in a practical sense, they don't bother. I don't argue that it can be done, but what we have here is a conflict in ability and practicality. I tend to not point someone in their first year in the craft to 52100. Nor would I expect them to get optimal HT, regardless of how subjective it is, there is still a point where it is 52100, or a high carbon steel with undissolved carbides, and retained austenite. I can put money on the latter in an objective sense, not necessarily pointing fingers at Gabe. Kilns simply take out a majority of the guesswork, and is an extension to the smith and his abilities. It always falls down to time and temperature, always. Like a recipe. Sometimes when you add a dash here and a dash there thr outcome is different than if you carefully measured out each portion of ingredients. I truly believe it is that simple. 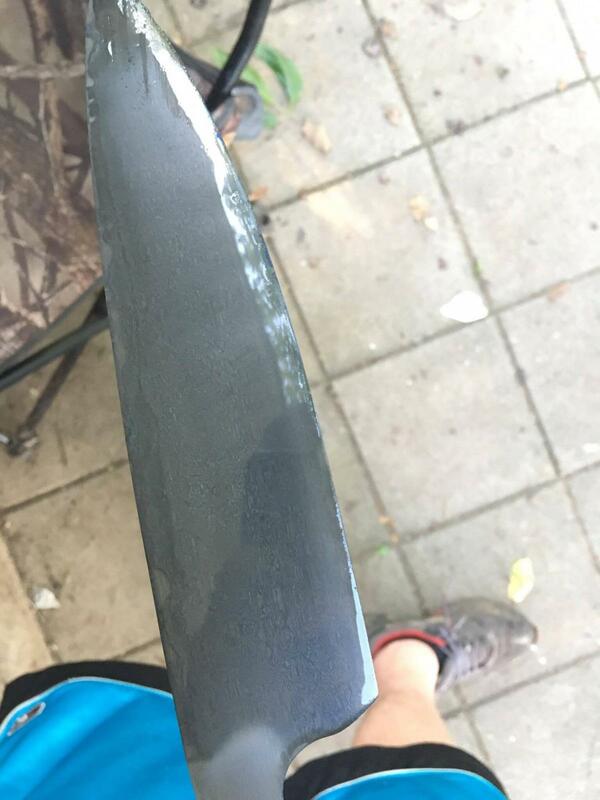 Ok so here's the knife polished up to 1k and etched in ferric. its hard to tell from the pictures, but its very clear in person. About 1/2" of steel starting at the blade's edge looks solid, while there is some alloy banding (im assuming undissolved carbides ?) running up to the spine. I started grinding at about 3/16" so i do not think its decarb. apology for the low quality pics too much reflection/light. Some of the lines you see are from moisture so ignore those. As soon as i wiped the water off it got very hard to see with the camera. Now that I see it on my computer, it looks like banding to me. Still hard to tell with pics though.